TEETH ARE NECESSARY FOR A HAPPY LIFE! Let's face it... We eat with them, we communicate with them....smiling and talking, and how they look and feel affects every aspect of life. What is the ability to EAT worth to you? What is the ability to SMILE CONFIDENTLY worth to you? Many people don't hesitate to buy a car for $20,000.00...pay for it in 4 years....and then have to do it all again a few years later and we only use it a few hours a day. Your teeth are for the rest of your life...AREN'T YOU WORTH IT? With the advances in implant and denture technology, you can soon be eating what you want, when you want and where you want. Your facial muscle tone will be restored. You’ll put 20 years of youth back in your face while you regain the self-confidence and quality of life abandoned when you lost your teeth. And you’ll be able to get it all in as little as 6 months. We offer a 6 month plan involving fixed bone implants and hybrid dentures that will look better than any natural smile you have ever had. With the All on 4 technique we use the latest cone beam CT technology to scan your bone and plan exactly where the implants will go. Patients usually prefer the comfort of IV sedation the day of the surgery. Any remaining teeth are removed and 4-6 dental implants are placed into the jaw bone in each arch under iv sedation while you sleep. Sometimes it is even possible to attach the prosthesis to your implants the same day, but depending on your specific situation it may be better to wait for the implants to heal first. Either way you will leave that day with a new set of teeth and a new smile. After a 4-6 month healing time, your final prosthesis is fabricated. The result is a lifelike, fully functional set of teeth that allows you the ability to eat whatever you want and to smile as big as you want. 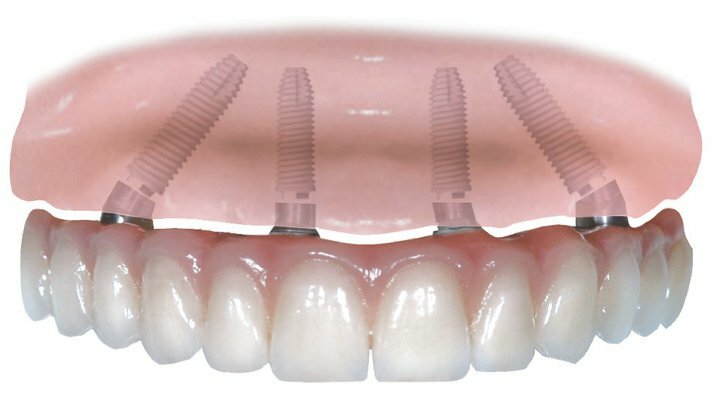 If you wear dentures or have a mouthful of missing or failing teeth, the All-On-Four fixed hybrid implant denture is the optimal solution. It is proven and cost effective. And it will give you a lifetime of happy, healthy smiles.